Cancer! Is There Another Option? 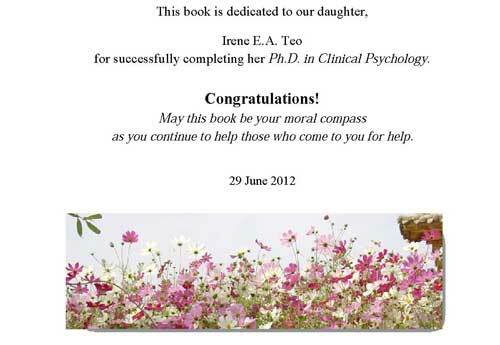 Given the dire state of affairs of the current medical treatments for cancer, it is no wonder that some patients know the real truths about conventional medical treatments of cancer, not through reading books, but through the observations and experiences of what had happened to their loved ones or friends, who, unfortunately became victims of cancer treatments. These patients want to know if there is another option for them. My answer is: Yes, there is another option. This book, Cancer – Is There Another Option? is our first book in a series of books that I shall be writing under the general title of Is There Another Option? Why do I write this? Primarily to satisfy the needs of those patients who write or come to see me after they are being told that they have cancer. The standard recipe of present day cancer treatments comes in different combinations of surgery, chemotherapy, radiotherapy and oral drugs of some sort. This is sometimes referred to as slash, poison and burning method of treatment. Many people say the treatment is worse than the disease and many patients died because of the treatment rather than their cancer. Some authors even went to the extent of saying that present day cancer treatment with highly toxic drugs is crude and is probably the most barbaric in modern medicine. Those who have undergone these treatments may understand what I am saying. Those who have not undergone them yet may not but the observant ones may have heard or learnt about it from the experiences of others. These patients now want to know if there is another option for them. My answer is, Yes, there is another option. In this book, I have shared with you stories of eleven patients who are from Africa, Australia, Hong Kong, Indonesia, New Zealand, Switzerland, United States of America and of course my fellow Malaysians. It appears to me that patients from every corner of the world do look for alternative treatments for their cancer. 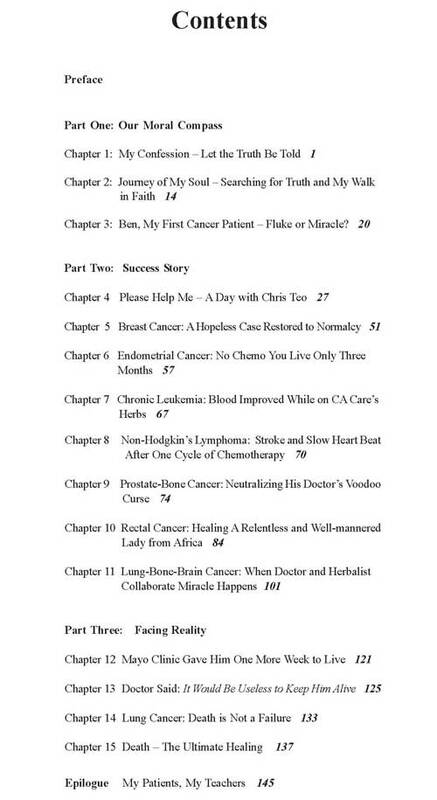 I hope by reading what I wrote, patients can find answers to the many questions they often ask, such as: I have been diagnosed with cancer, what do I do now? What is your experience in treating this or that cancer? What evidence do you have to show that the treatment is effective? I hope you will not only find the answers you seek but also learn something from the experiences of others. Over the past many years, many (thousands!) cancer patients had come to seek our help and advice. They wanted to know what else they could do, generally after modern medicine had failed them. Most of these patients were totally ignorant of what they were up against. Many think that they could easily find a cure for their cancers. They come seeking for that non-existent magic bullet for their cancer. Alas! Many failed to find a cure. At CA Care we don’t talk about cure, because we do not see a cure for any cancer. But we see healing. Healing comes from within, not from the outside. Patients have to learn how to heal themselves. In cancer, it is worth noting that ignorance kills. To be able to find healing, patients should realise that they must do something for themselves, not to rely entirely on others to help them. At this point, we are reminded of our friend (and patient) S.K. He had metastatic liver cancer. He said: I saw the oncologist. He told me to do the chemo. When I saw everybody do chemo, everybody do radiotherapy, I told myself this must be the only way. I went back to the doctor and asked him to do the chemo on me. S.K. underwent both chemotherapy and radiotherapy. He did not get well but instead ended up with three more tumours in his liver. And they were growing in size. SK told me, I knew then that I had taken the wrong path. I started to find other ways. So, S.K. set out on his own healing journey, following the so-called unproven path and found relief. Not all patients are like S.K. and not all patients are as wise as S.K., who knew that he had to get out of the box and seek new hope elsewhere.